Farryl Hadari has been an educator in the field of puppetry for more than 30 years. 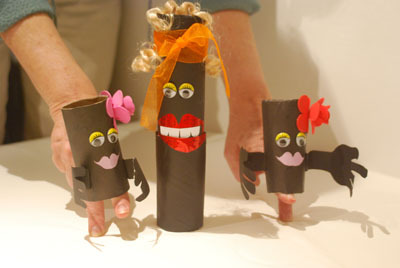 She has initiated many puppetry projects... read more. 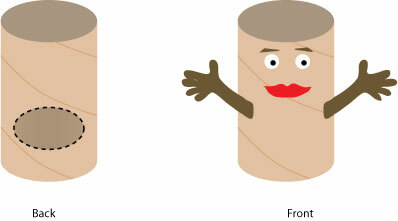 In the bottom back side of the cardboard toilet paper roll, cut an oval shape which is big enough for two fingers. Decorate the front side with a puppet face, body and arms. Put your index and middle fingers through the oval shape until they come out of the opening of the cardboard toilet paper roll. Your fingers now are the puppet's legs. Move them and make your puppet walk. speakingpuppetry.com © All rights reserved to Farryl Hadari. Site created by Nurit Kirshenbaum.